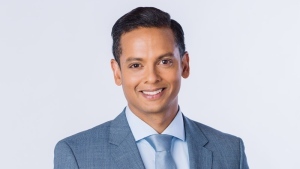 Jason Pires is a co-anchor of CTV Morning Live in Vancouver. Born and raised in Victoria, Jason earned a Bachelor's degree in Psychology while playing varsity soccer at the University of Victoria. After taking a year off to backpack Europe – he returned to school to complete the Broadcast Journalism program from BCIT, before starting his career in his hometown in 2000 as a news reporter for CHEK-TV. In 2001, Jason helped launch a brand new television station in B.C. 's capital (now known as CTV Vancouver Island) and served as its original sports director/anchor/reporter. Under his leadership, the sports department established itself as a market leader for Vancouver Island sports coverage. After more than six years at CTV Vancouver Island, Jason was ready for a new challenge – and with the lure of the 2010 Vancouver Olympics, he jumped at the chance to join the sports department at CTV Vancouver, the official Olympic network. Without a doubt, Jason's career highlight so far was covering the Olympics and Paralympics in Vancouver/Whistler. He knows that will be hard to top . But the 2011 Vancouver Canucks Stanley Cup run came close -- as well as covering the inaugural MLS season of the Vancouver Whitecaps. Another memorable moment was when he went down to Phoenix to cover Steve Nash's back-to-back NBA MVP awards. Jason and the NBA future hall-of famer were actually childhood soccer and baseball teammates in Victoria. Jason also enjoys volunteering and participating at various community events and fundraisers including the B.C. Cancer Foundation's Ride to Conquer Cancer, the Kids Help Phone Walk, the Children's Wish Foundation, the JDRF Ride to Cure Diabetes, and a handful of charity golf tournaments. In his spare time, Jason enjoys running the seawall, trying to improve his golf game, spending time with family and friends and of course eating out at Vancouver’s world class restaurants.